Key players playing a major role in the global arc fault circuit interrupter (AFCI) market include Eaton Corporation, General Electric, Siemens Industry, Inc., Legrand SA, Schneider Electric SE, and Leviton Manufacturing Co. Several companies in the arc fault circuit interrupter market are focusing on research and development in order to innovate safer types of arc fault circuit interrupters, while combining AFCI and GFCI in an integrated unit has also become a popular trend. The initiation of mandatory regulations regarding the use of arc fault circuit interrupters is likely to remain a determinant trend for players in the global AFCI market in the coming years. According to Transparency Market Research (TMR), the global arc fault circuit interrupter (AFCI) market stood at US$3,769.3 mn in 2017. The study projects the global arc fault circuit interrupter market to expand at a CAGR of 5.1% during the period from 2017 to 2025 to reach US$5,596.7 mn by 2025. This growth is due to increasing adoption of AFCI instead of traditional circuit breakers and mandatory implementation of AFCI in new construction in several regions. 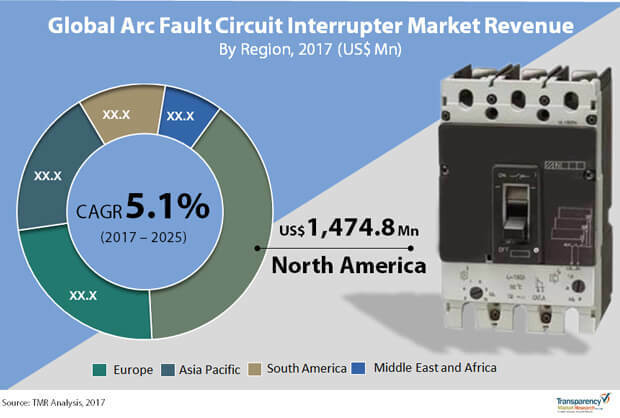 Geographically, North America is expected to remain the dominant contributor to the global arc fault circuit interrupter market in the coming years, exhibiting the fastest CAGR of all regional segments. Europe and Asia Pacific are also likely to remain important to the global arc fault circuit interrupter market in the coming years. By product type, branch/feeder type arc fault circuit interrupters are likely to retain the lead in the market, followed by combination AFCIs. The prime driver for the global arc fault circuit interrupters market is the rising government support to measures that aim to preserve safety of residential electrical setups. The risk of heavy monetary and human damage posed by arc fires has led to mandatory installation of safety measures such as arc fault circuit interrupters in developed regions such as North America and Western Europe, and an increasing number of developing Asia Pacific economies are also following suit thanks to the booming construction industry in these regions. China, India, and Australia are likely to remain key contributors to the global arc fault circuit interrupters market in the coming years due to the rising performance of the construction industry in these regions and the steady government support afforded to inclusion of safety features such as arc fault circuit interrupters. The rising financial strength of the construction industry in these emerging countries could lead to strong demand from the arc fault circuit interrupters market in Asia Pacific, as the construction industry has made the most of the rising disposable income of urban consumers. The rising awareness about safety initiatives in the residential construction sector is also helpful for the arc fault circuit interrupters market in Asia Pacific. Booming economies in the Middle East are also likely to play a vital role in the development of the arc fault circuit interrupters market in the coming years.